With the U.S. economy continuing to grow, and with the summer "moving season" approaching, many Americans are pondering: Is now a good time to buy a home? Well, if you've found your dream house and concluded that you simply have to own it, economic statistics and housing market data are unlikely to sway you. However, if you haven't discovered your perfect house, and there are no other factors requiring you to move, you may want to bide your time a bit longer. 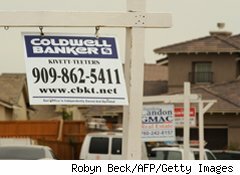 The housing market continues to show signs of sluggishness, and unless job growth accelerates, prices are likely to remain weak to tepid in many major U.S. metropolitan areas. And unless U.S. GDP growth revs up substantially, you'll probably get more value for your home-buying dollar in six or nine months than you would today. Although the median sales price of a new home declined 8.9% in February to $202,100, and the median sales price of an existing home dropped 5.2% from a year ago to $156,100, the tell-tale stats for prospective home buyers to watch are the new and existing home inventory numbers. Right now, the pair suggest that prices will stay soft through the third quarter of 2011, and possibly for longer. In February, the new home inventory rose to a 9.6 month supply at the current sales pace, up from an 8.9 month supply in January, and existing home inventories rose to an 8.6 month supply at the current sales pace, up from a 7.5 month supply in January. All other factors being equal, until home inventories drop below five-month levels, the oversupply most likely will continue to weigh on prices. While it's possible (but not likely) for prices to rise in a sustained way as inventories rise, the rule is: Rising inventories, downward pressure on prices; falling inventories, upward pressure on prices. So in the months and quarters ahead, keep your eye not only on median home prices, but also on home inventories. If inventories are flat or continue to rise through summer, take it as a sign that a sustained housing recovery has not occurred, and that the dreaded double-dip housing recession may have started. On the other hand, if inventories decline through summer, that will be at minimum a sign of stabilization in the housing sector, or at best, a sign that rising home prices are ahead.